Swiftech today announced the release of its next generation of AIO Liquid Cooling Kits, the Drive X2 and the Drive X2 “Prestige” series. “Our goals during the development of this series of products were to continue improving upon the performance of our all-in-one kits, and to broaden their appeal to an even larger audience,” said Gabriel Rouchon, Swiftech’s Chairman and CEO. “In previous generations, thermal and acoustic performances were always at the top of our agenda, but we were also first to introduce the concept of upgradability because we wanted to offer AIO’s that COULD be customized. One of the most significant changes for the Drive X2 series AIO is the fully redesigned patent-pending radiator/reservoir/pump combo featuring a large clear acrylic reservoir of tubular shape, and showing the inner workings of the system’s powerful pump. The radiator comes in 3 sizes, dual 120mm, dual 140mm, and triple 120mm. The large coolant reserve prolongs operations without maintenance well beyond the 3 year product warranty. The second component to see substantial changes is the new Apogee XL2 CPU water block now featuring a chrome plated copper base plate and a redesigned housing with enhanced flow characteristics for better hydraulic performance. The housing is made of clear acrylic material to visualize the coolant flow path and to create fantastic color and light reflections thanks to an all-new system of RGB ALED lighting system. The water block installation hardware has been enhanced for an even easier trouble-free installation, and it is compatible with all current desktop processors. 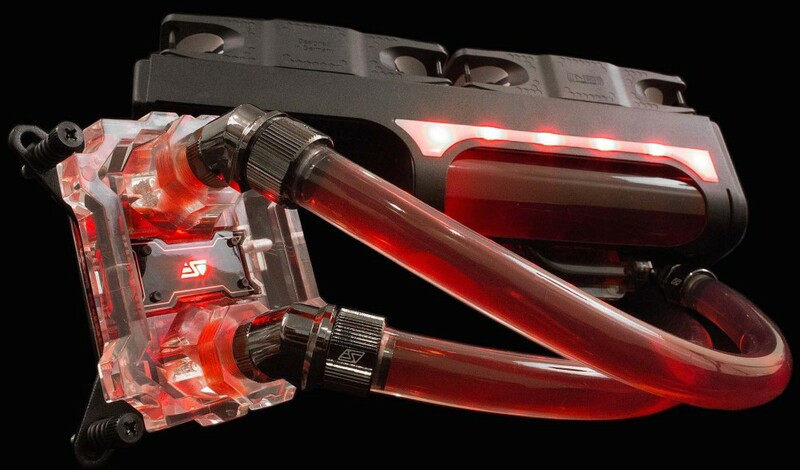 Finally, the kits now use clear tubing, a remarkable departure from other AIO products made possible by Swiftech’s use of a large coolant reserve, and most notably the new Addressable RGB LED (ALED) technology implemented on water block, reservoir, and radiator accent piece. The “Prestige” version of the kits includes all of the above, but features even more advanced product updates, focusing on extraordinary performance at low noise, as well as top shelf hardware. The Prestige line includes the world-renowned Noiseblocker eLoop fans, that take these kits a step ahead of anything the company ever tested in terms of thermal performance in near-silent silent operations. Finally, the “Prestige” versions use Lok-Seal black chrome compression/rotary fittings throughout, for this final touch of luxury feel that characterizes all true custom systems. These products will be released for sale to end-users worldwide on January 6, 2016, during the Consumer Electronics Show (CES) in Las Vegas, Nevada. Swiftech will be showcasing their products in a press suite at the Caesar’s Palace Hotel. MSRP on the H220X2 and H220X2 Prestige starts at USD $139.95 and ranges up to USD $214.95.